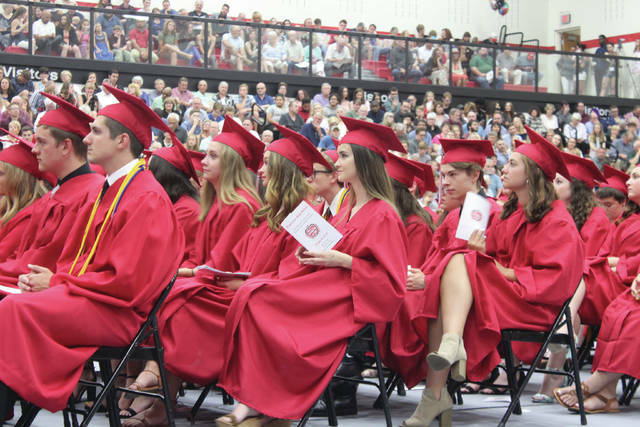 Tipp City Schools Members of the high school choir performed during the Tippecanoe High School 2018 commencement ceremony May 26. Tipp City Schools Seniors listen to addresses from the speakers at the graduation ceremony May 26. Tipp City Schools Lauren Weimer (right) and Ashley Ratcliff (left) perform with THS teacher Cory Breth during the commencement ceremony. 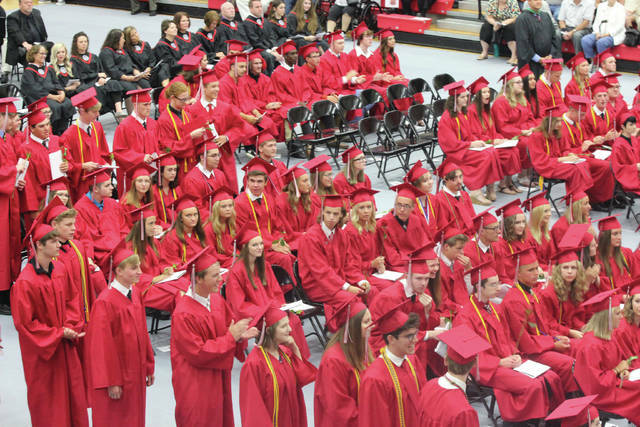 Tipp City Schools Student line up to receive their diplomas on May 26. 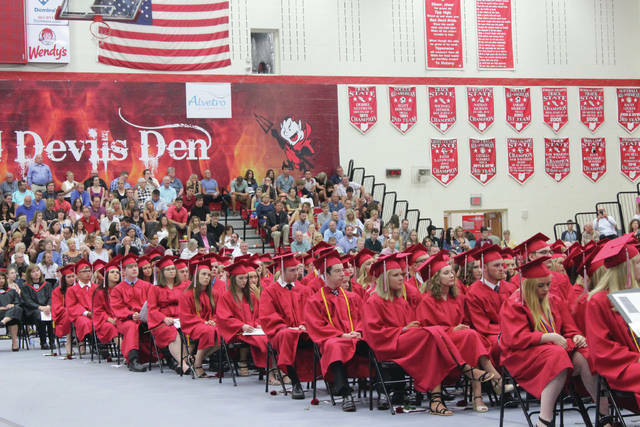 Tipp City Schools The 2018 Tippecanoe High School commencement ceremony was held in the high school gym on May 26. 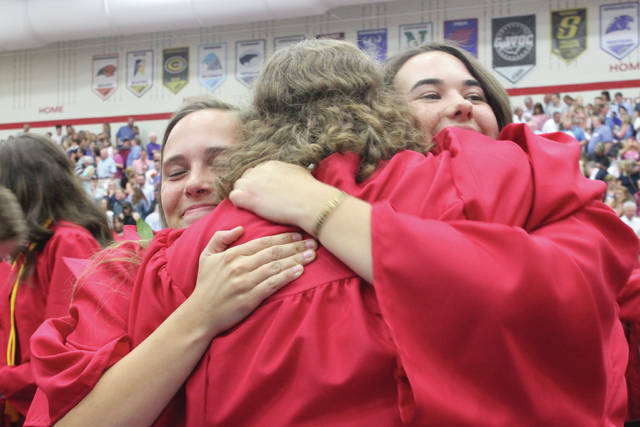 Tipp City Schools Excited graduates hug and congratulate each other following the commencement ceremony. 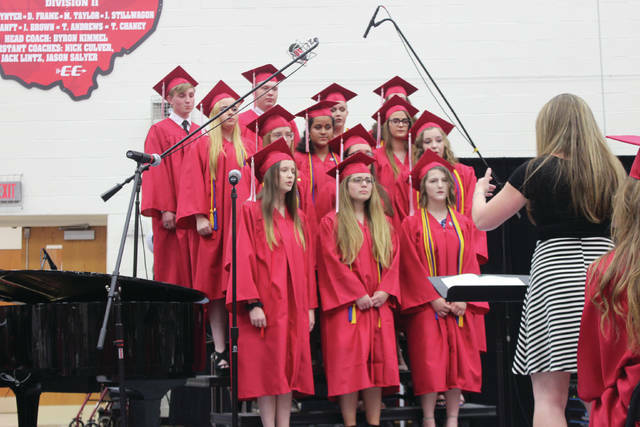 Members of the high school choir performed during the Tippecanoe High School 2018 commencement ceremony May 26. Seniors listen to addresses from the speakers at the graduation ceremony May 26. 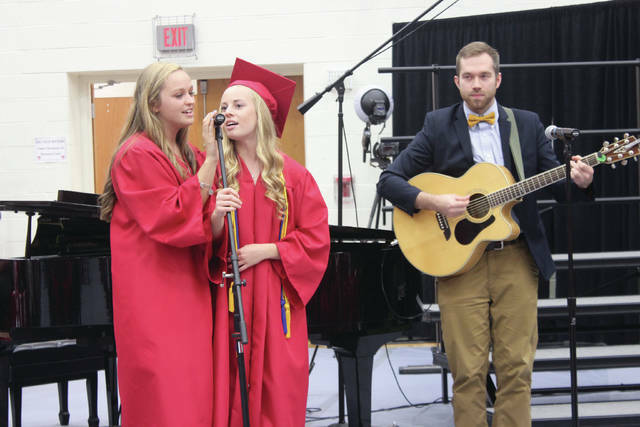 Lauren Weimer (right) and Ashley Ratcliff (left) perform with THS teacher Cory Breth during the commencement ceremony. Student line up to receive their diplomas on May 26. 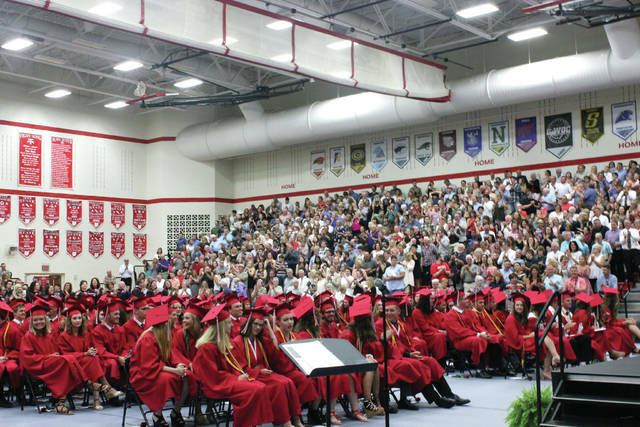 The 2018 Tippecanoe High School commencement ceremony was held in the high school gym on May 26. Excited graduates hug and congratulate each other following the commencement ceremony. https://www.weeklyrecordherald.com/wp-content/uploads/sites/51/2018/06/web1_IMG_7418.jpgTipp City Schools Members of the high school choir performed during the Tippecanoe High School 2018 commencement ceremony May 26.
https://www.weeklyrecordherald.com/wp-content/uploads/sites/51/2018/06/web1_IMG_7390.jpgTipp City Schools Seniors listen to addresses from the speakers at the graduation ceremony May 26.
https://www.weeklyrecordherald.com/wp-content/uploads/sites/51/2018/06/web1_IMG_7462.jpgTipp City Schools Lauren Weimer (right) and Ashley Ratcliff (left) perform with THS teacher Cory Breth during the commencement ceremony. https://www.weeklyrecordherald.com/wp-content/uploads/sites/51/2018/06/web1_IMG_7600.jpgTipp City Schools Student line up to receive their diplomas on May 26.
https://www.weeklyrecordherald.com/wp-content/uploads/sites/51/2018/06/web1_IMG_7613.jpgTipp City Schools The 2018 Tippecanoe High School commencement ceremony was held in the high school gym on May 26.
https://www.weeklyrecordherald.com/wp-content/uploads/sites/51/2018/06/web1_IMG_7619.jpgTipp City Schools The 2018 Tippecanoe High School commencement ceremony was held in the high school gym on May 26.
https://www.weeklyrecordherald.com/wp-content/uploads/sites/51/2018/06/web1_IMG_7653.jpgTipp City Schools Excited graduates hug and congratulate each other following the commencement ceremony.